Description from the publisher: The Queen of Bread tries to teach her three daughters how to cook her famous dish. But the three princesses are busy with other things, and they don’t want to learn how to bake bread. 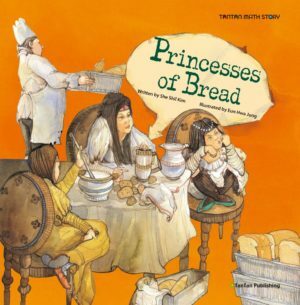 When the Queen of Bread falls ill, the princesses don’t know what to do! Can they learn to bake bread to save the kingdom and heal their mother? Readers will learn the importance of measuring in this whimsical story. Activities and questions will engage readers as they measure quantities and evaluate the information within the story.